In traditional spreadsheet approaches, to view data trends users will need to specify certain columns and rows to construct a graphic view on the data of interest, e.g. bar or line graphs. This process will be repeated for viewing a diagram for each data area individually. Taking a different approach, Trend View enables users to perform a mouse-driven data browse on the spreadsheet and visualized data (e.g line graphs, 3D plots) will be displayed accordingly. Additionally, in Trend View data values can be visualized by color indexing. 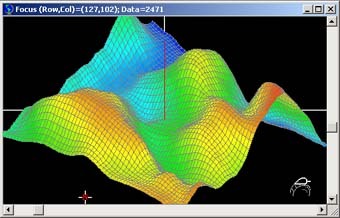 Trend View can exchange data with MS-Excel and Matlab, and retrieve data from most commercial databases. 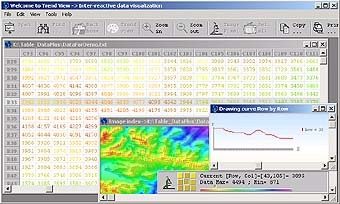 Trend View can be used in many application areas where visual inspection of data trends is desirable, for example, scientific statistics, historical stock prices, environmental study, etc. After color-indexing the spreadsheet, a global color-only view of the data is also generated. Each pixel of this color index image corresponds to a data value in the spreadsheet, at the row and column coordinate that matches the pixel's position. Using this feature, users can easily observe data trends by inspection. The color index image also serves as an interactive index: users can use the mouse to navigate on the image window, and the spreadsheet window will be driven to center on corresponding data automatically. Once users have identified regions of interest in the dataset, Trend View provides traditional features of line graph, bar graph, and 3D plot to facilitate data analysis. In Trend View, users can specify a value range to find and view results through a color indexing of target data values. Valid data ranges can be set to lower/higher than or equal/not equal to a specified value, as well as a range between upper and lower thresholds. 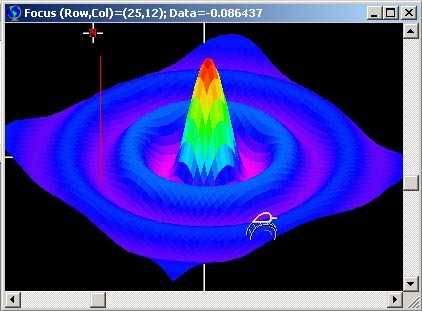 The Find feature will produce a color index image, where values that are not in the target range are grayed out. 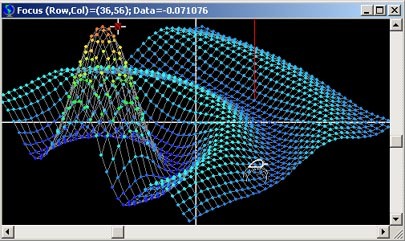 In the 2D graph window, the value and row/column information for any point, indicated by your mouse cursor, will be displayed dynamically following the cursor's motion. You can also mark values of interest for reference when browsing other sections of data with the graph window, as well as used them for value comparison. In the 3D graph window, 3D plots can be zoomed in/out or rotated in any direction (by dragging the plot and use of the scroll wheel). Moving the mouse cursor (right-dragging) in the spreadsheet or color-mapping window, graphs in the 2D/3D window will be updated accordingly. Set conditions (if any), including lower/higher than or equal/not equal to the specified value, or values between certain upper and lower thresholds. Perform calculations, for example, count all or specified items, sum, maximum/minimum, average, percentage, data distribution (histogram) etc. Trend View can process up to 2000 rows and 1300 columns. Trend View can directly read text files (.txt) produced by MS-Excel and Matlab. 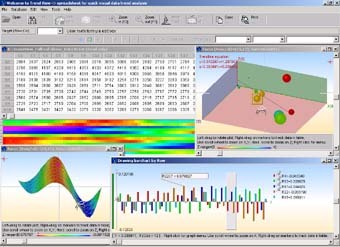 Output from Trend-View can be directly read by MS-Excel, Matlab or any other text editors. Between Trend View and MS-Excel, data can also be transferred through copy/paste. Trend View can retrieve data from any ODBC compatible databases (e.g. DB2, Oracle, Sybase, SQL Server, Access, dBase, FoxPro, etc). Trend-View provides an SQL generation wizard to help users specify data retrieval conditions and generate SQL statements automatically. Trend View can read any text files that are formatted as the following: each record is ended by pressing the Enter key; data fields should be delimited by tab, comma, semicolon, space or any user specified symbols. Trend View can read stock historical prices text files (.txt).